This large reception in Cincinnati set a new record for the number of guests diving off the stage in front of our DJ booth. Stephanie & Nate had ‘The Perfect"‘ wedding reception at the Hilton Columbus Downtown, and we were SO HAPPY to be a part of it. They had lots of unique items to make their reception truly stand out. 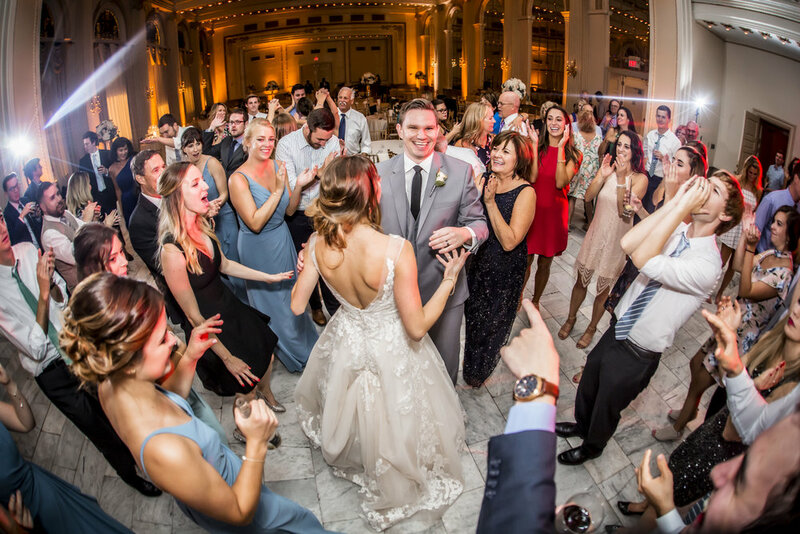 This couple told us ‘the bigger the party the better’ for their reception in downtown Columbus. Simply put, Susie & Steve had the perfect classic Westin Columbus Wedding. This was a wonderful wedding reception in the country! The best part was Abbey & Matthew’s first dance which had all their guests all around them with sparklers. So we LOVE IT when couples tell us they want to do something different. Zoe & Nick went to a new level...And that level was to have a fashion model runway for the wedding party to use for the introductions! So wedding planning can be a bit overwhelming as you plan over the most minute details. But trust us, it does pay off. Matthew & McKenzie's wedding is proof that the small personal details will pay off big for your reception. Christina and Kyle had just about the perfect fall wedding reception. The weather was wonderful, they looked so good together, and best of all - they had a GREAT party! Hollywood could not have made a better script than what happen for Leah & Alex! Leah had this awesome smile on her face the entire day. One of the first things that Sami told us that about her reception was that 'they will have LOTS of eager dancers". That was an understatement! This was a wonderful wedding day that had SO MANY memorable moments in it - both in the ceremony and the reception. Its just the way THE wedding day is supposed to be! This beautiful ceremony and reception at The Ohio Statehouse featured one of the most memorable moments we've ever seen! So its tough to make one of the most beautiful ballrooms in Central Ohio look even better. But Raenell & Jonathan made it look magical for their wedding reception! Beautiful and elegant, with a modern twist is how I would describe this reception at the Westin Columbus. There are three things that stick out to me when I think about this reception. The wedding party and their introductions. The toasts. And the celebration! We’ve known Kyle for many years, and it was a honor when we were asked to be the DJ for this very special reception. This was such a great wedding reception at The Athletic Club. Its these kind of receptions that make our jobs so much easier. It seems that at every wedding reception there is that one or two moments that you really stick in your memory. For this wedding it was the Maid Of Honor's toast to the new couple. A really fun reception at the Hilton Easton complete with unique introductions and props to go with it!